The first “real” competition to the original iPad was the 7-inch Android-based Samsung Galaxy Tab, and it looks like the first “real” competition to the iPad 2 will be the Galaxy Tab 10.1, a Honeycomb tablet boasting a 10.1-inch, 1280×800 display, a 1GHz dual-core CPU, dual-antenna WiFi, a 3MP back-facing camera and a 2MP webcam that starts at prices of just $499… all in a form factor that Samsung claims is both thinner and lighter than the iPad 2. Well, except it turns out that Samsung’s claims about a thinner iPad 2? They appear to not be true. Fritz Nelson of InformationWeek ended up getting a couple comparison shots between the Galaxy Tab 10.1 and the iPad 2, and found that contrary to Samsung’s claims, the Galaxy Tab was still slightly thicker. 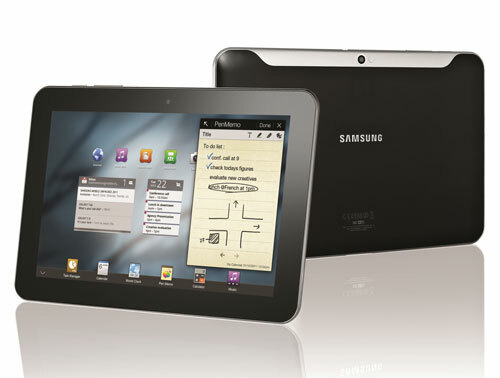 It’s possible that the unit on display was a prototype, so maybe the Galaxy Tab 10.1 is thinner than the iPad 2. But my guess is it’s all a marketing lie, considering the fact that Samsung’s also been busted for hiring actors to pretend to be fans of the Galaxy Tab. Who really cares? Honestly, if buying a tablet with Android installed on it isn’t going to dissuade you — and it should, given the execrable history of past Android devices being updated to later, more feature-rich versions of the OS by their manufacturers — a matter of a couple millimeters and a couple of actors isn’t going to cure you of your delusions either.